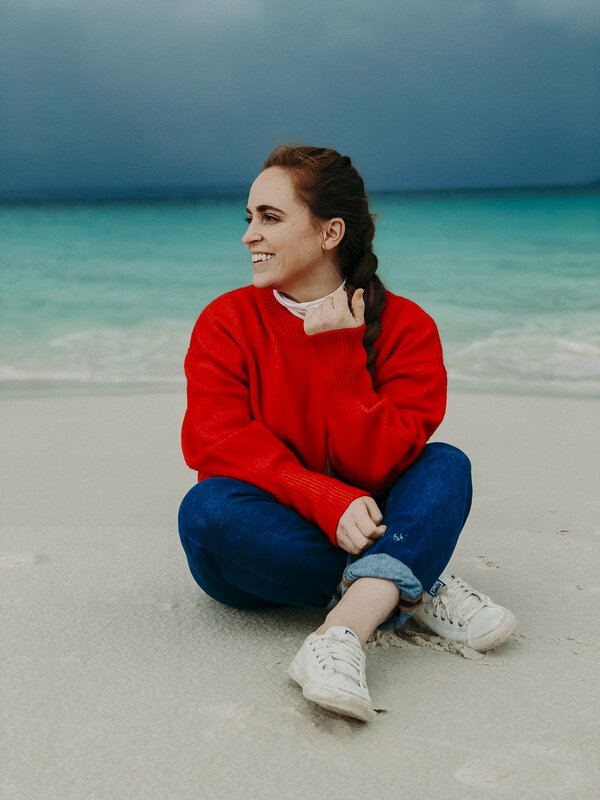 When I learned that the whitest sand in the world was located on Hyams Beach, which was just a few hours from where my family lives, in Australia, I knew I had to go! 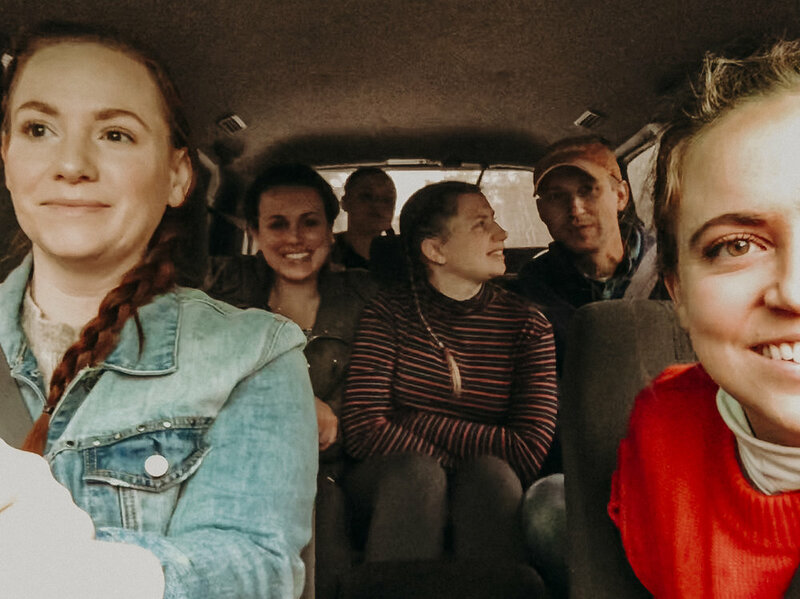 So, while my friend Christine was visiting, we booked a little beach cottage for us all to stay in, and drove out to Jervis Bay, even though the weather was not looking great. 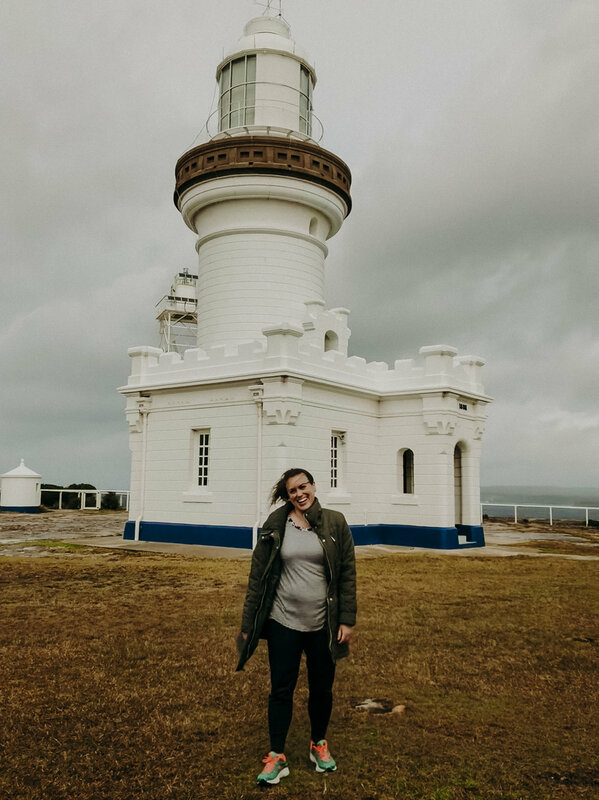 Our first stop in Jervis Bay was Point Perpendicular Lighthouse. 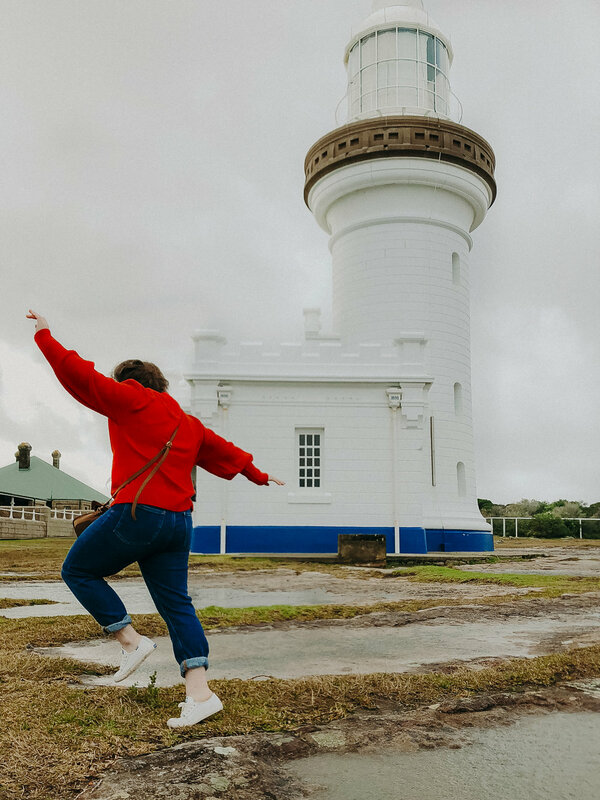 This beautiful, little lighthouse sits on a large cliff, overlooking Jervis Bay and the Pacific Ocean. When we arrived, the wind really picked up, making our experience at Point Perpendicular a memorable one! I have never, personally, experienced such strong winds. They were the kind that could blow you right over… and they did, a few times. We definitely shared some serious laughs while we were there. And while the wind could have ruined the experience, for some; for us, it just enhanced it! After the lighthouse, we decided to drive into town, to see if we could wait out the storm a little, before heading to the beach. We grabbed lunch at Nutmeg Cafe, which was absolutely delicious! While I did order a healthier meal, for myself, I also ended up ordering some of their pancakes, to share… Because I couldn’t resist! Once our bellies were full and the wind had died down, we drove over to Hyams Beach, where we were greeted with the whitest sand in the world! 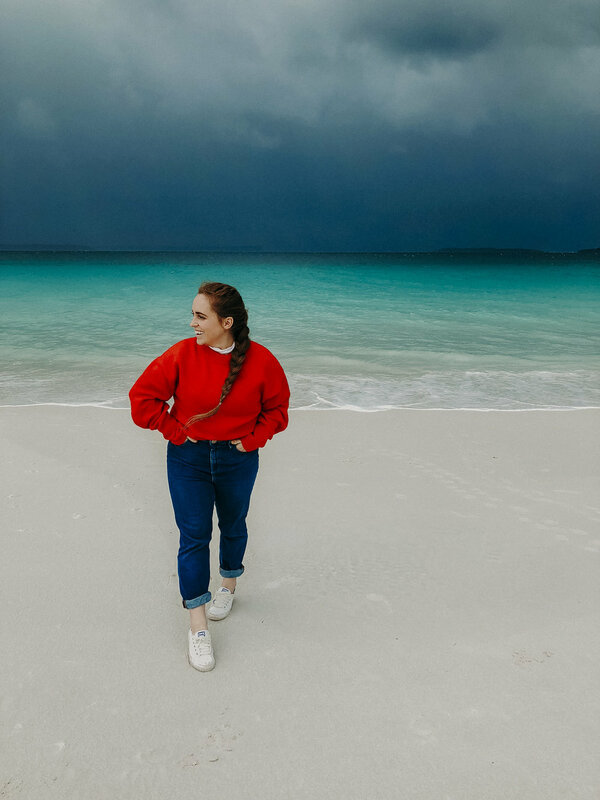 Hyams Beach was really a spectacular sight to see… The white sand against the blue waters and the black storm clouds created an almost unbelievable atmosphere. The sand was so white, it looked like snow, from a distance. We spent the rest of our afternoon playing in the sand and exploring the tide pools. Then, just as we were about to leave, a rainbow completed the picturesque scene and our day. Not pictured: My two nephews hiding in the backseat. Here you can see Point Perpendicular in the distance, from Hyams Beach. My edit definitely gave the sand a brownish-hue. This photo shows it, the best! 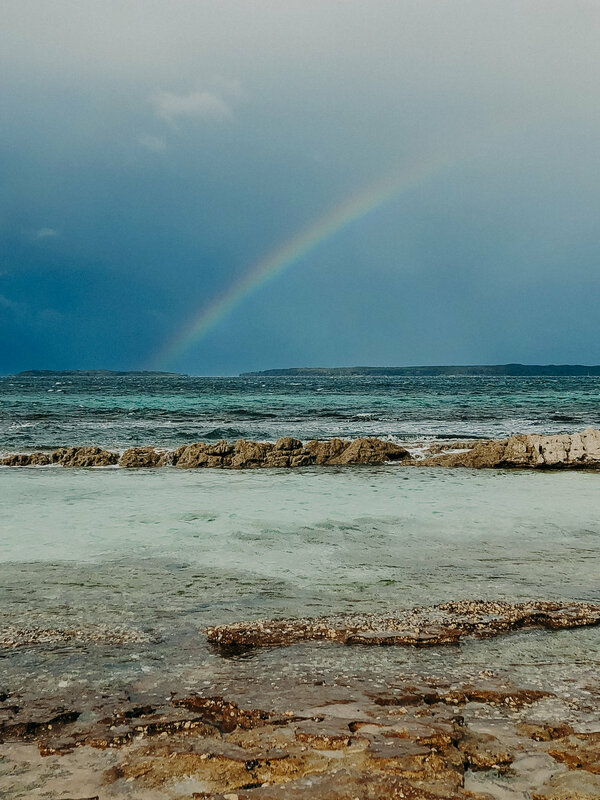 I am so glad we ended up making the journey out to Jervis Bay and Hyams Beach, despite the weather forecast. Truly, the weather made the experience more beautiful and memorable than I could have asked for.